Wash squash thoroughly. Drop in boiling salted water; reduce heat and cook, covered, 15 minutes or until tender but firm. Drain and allow to cool to touch. Place squash, flat side down, on a smooth surface; scoop out pulp, leaving a 1/4-inch shell. Chop pulp and combine with next 6 ingredients, stirring well. Spoon stuffing mixture into shells. Place squash in a shallow baking pan; pour in enough water to cover bottom of pan to prevent sticking. Bake at 350 degrees for 25 minutes. Remove from oven., Sprinkle cheese over squash; bake 5 minutes or until cheese melts. 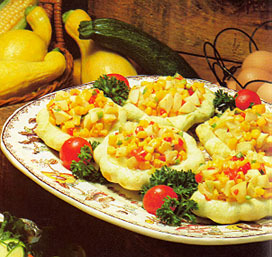 Arrange squash on a platter with tomatoes and parsley. Yield 6 servings.